Grota Homestead, located near the late 19th century community known as Germantown just northwest of downtown Houston, was the beginning of Grota Homestead Neighborhood. Platted first for residential development in the 1890s, subsequent plats added to the subdivision’s size through 1920. Primarily a working and middle class neighborhood, Grota Homestead is an integral component of the early 20th century suburban development that included the adjacent Woodland Heights neighborhood. 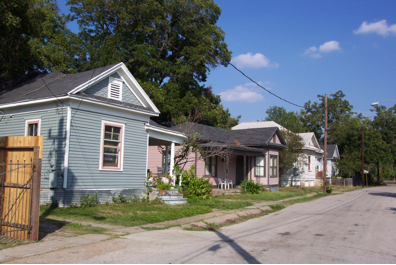 After World War II suburban development sent the area into a slow economic decline and construction of I-45/North Freeway in the 1960s resulted in the demolition of many homes, severing the area’s connections to historic neighborhoods to the east. The neighborhood is eligible for listing in the National Register of Historic Places as a locally significant historic district but is threatened by development pressures. The Texas Department of Transportation’s proposed widening of I-45 on the east side of the neighborhood is the threat. The project would displace residents, hamper local revitalization efforts, compromise the tax base and result in the demolition of many significant historic buildings.